99.99 % of all banjo players fall squarely in one camp or the other: Clawhammer or bluegrass. It’s kind of like the Hatfields and the McCoys; you’re either with us, or you’re against us. This silly notion has lingered for too long. 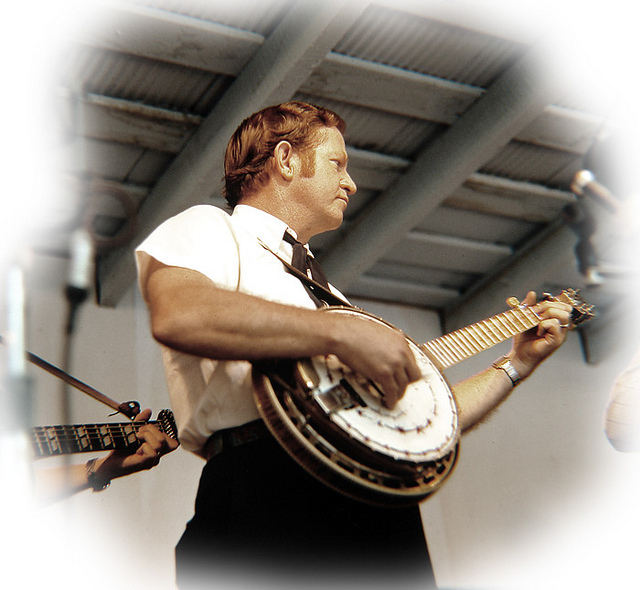 Let’s do our part in poking holes in this crazy idea by looking at the life of a renowned banjo player who played both styles extremely well: the late Don Stover. Of course, the lack of local music stores not only hindered Don from using the fancy store bought fingerpicks, but it also reminds us that there were no banjo instruction books to help him learn. His only option was to listen to Earl on the Grand Ole Opry once a week on Saturday night. After three long years, Don finally figured out how to play like Earl. But unlike many other banjo players, he did not forsake the clawhammer banjo style that he grew up with. Instead, he embraced both. In 1952, Don joined the Lilly Brothers and moved to Boston, Massachusetts, where they began a tenure playing at The Hillbilly Ranch six nights a week, fifty two weeks a year until 1970. In 1957 Don did take a leave of absence from the Lilly Brothers to take a job playing with Bill Monroe himself. The classic songs Don recorded with Monroe include A Fallen Star, Four Walls, A Good Woman’s Love, Cry Cry Darling, I’m Sittin’ on Top of the World, Out in the Cold World, Roane County Prison, Goodbye Old Pal, In Despair, Molly and Tenbrooks, and Come Back to Me in My Dreams. Before you even think about playing “Things in Life,” you should listen to it. Don recorded it on an album entitled “Things in Life,” on the Rounder label. You can download it, or here is a link to a YouTube clip of Don playing the song. Clawhammer Banjo: If you’re an old-time or clawhammer player, you know that your basic stroke is claw-ham-mer, claw-ham-mer. Normally, the “claw” is the melody note. The numbers you see on the lines of the tab are your “claw.” On the notes where the melody note is on the 4th string at the 4th fret, you’ll find that it’s difficult to play that note and also hold down a C chord at the same time. In this case, I would just do my clawhammer on the open strings and not worry about the playing a chord. Bluegrass Banjo: the easiest roll in your toolbox of rolls is probably the thumb-pinch. That means you play the melody with your thumb. Following that, merely play the 1st string with your middle finger and the 5th string with your thumb. The rhythm you’re trying to get is thumb-pinch, thumb-pinch, or one TWO, one TWO. To play “Things of Life” using the thumb-pinch, merely play a melody note followed by a pinch. That’s it. Slides: One ornament you can play to make the song sound a little fancier is a slide. When you get to the 4th string, 4th fret notes, merely fret the 4th string at the 2nd fret and slide up to the 4th fret. That will sound really good when you get it. Key: “Things in Life” has been recorded in a variety of keys. Don Stover- B, Ricky Skaggs-C, Brooke Aldridge- G, Jerry Douglas- C, Country Gentlemen- A. For more information about playing banjo in clawhammer style, check out Wayne Erbsen’s book: Clawhammer Banjo for the Complete Ignoramus! Wayne has written three bluegrass banjo books: Bluegrass Banjo for the Complete Ignoramus!, Bluegrass Jamming on Banjo, and Starting Bluegrass Banjo from Scratch. Also check out his instruction books for fiddle, mandolin and guitar at www.nativeground.com. Free catalogs are available by calling Native Ground Books & Music at (828) 299-7031. 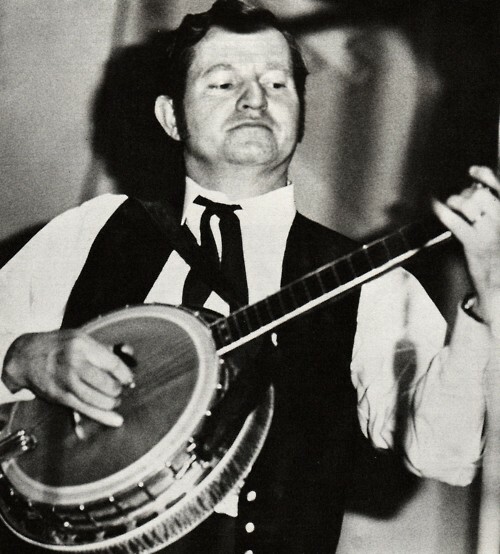 Ralph Stanley plays both clawhammer and bluegrass style, and on some early records he played in a two-finger style. 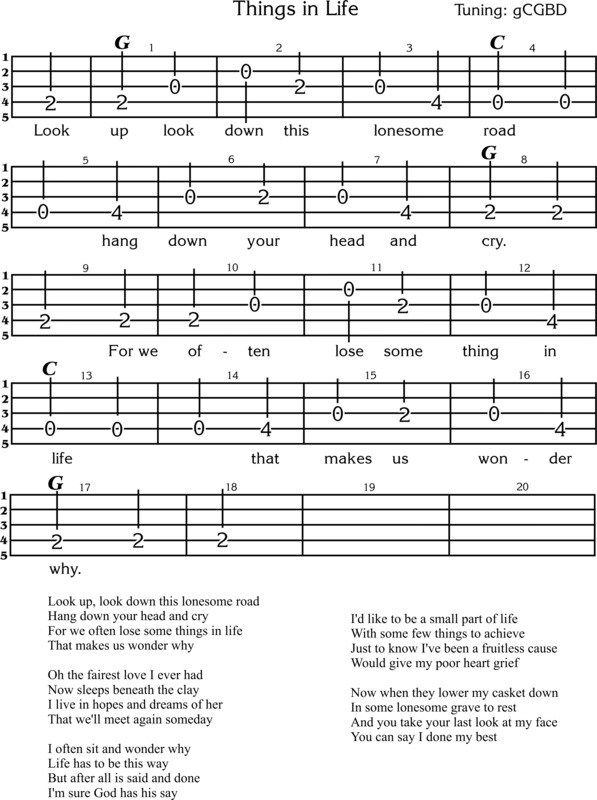 I play both clawhammer and some old-timey fingerstyle., Years ago, I was a competent, but uninspired bluegrass banjo player. I quit playing this style when 1. The band got a much better banjo plkayer, and I was a much better rhythm guitar player; and 2. I really needed a decent bluegrass banjo, and I had no money. 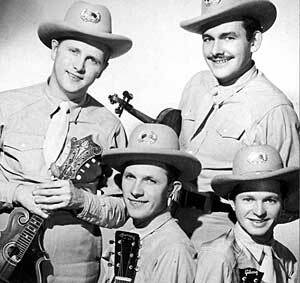 Do you remember the band that featured Larry Richardson on bluegrass banjo and Happy Smith frailing? What a sound that was! Hey Wayne. Yes, I have that County record with Larry and Happy. It makes me happy just thinking about it. Jim Pankey from around Chattanooga immediately comes to mind as someone that’s not just competent, but shows a real mastery of both styles. If you’re not familiar with him, you should look him up. I’d like to meet him. Molly Tuttle plays both extremely well! Unfortunately I never had him get me started on claw hammer. I think Don is fairly unique because he could frail with his picks on. I have a recording of Old Reuben at a festival campsite, about two thirds of the way through he frails the tune once and goes back to 3 finger seamlessly. He also does this on the Banjo Spirits video on the traveling banjo picker. Don was my great uncle. I never got to meet him but that would have been amazing. His brother Ancel, who I was very close to, passed on Christmas Eve recently. They inspired me to play the guitar and banjo.